The Dark Family which is also called The Black Family is a AAA stable. The main trios is Scoria, Cuervo and Ozz. 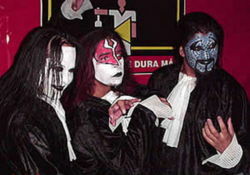 Charly Manson, Espiritu and Chessman have been associated with the group at times. The Black Family has often operated as a subgroup in larger stables; they've been part of LLL, and then were members of La Secta, Legión Extranjera and now La Parka's Inframundo. The group formed in 2000 when Charly Manson left Los Vatos Locos with Chess man, Scoria and Cuervo. After touring NOAH as Path Finder in 2001, Ozz joined the group after Charly Manson got injured. At this time Chessman became the leader and led his followers to join LLL. While this happened, Charly Manson left AAA and joined IWRG creating a new Black Family. In 2002 Charly Manson returned to AAA but as a member of Los Vipers. In 2005 Cibernetico formed La Secta and included Manson, Chessman and by default the Black Family. In 2006 Cibernetico introduced Muerte Cibernetica as a new member to feud with La Parka while injured. During this time, Muerte Cibernetica lost his mask and turned into Asesor Cibernetica leading a coup in La Secta. In the summer of 2008, it looked like there was rift growing in between La Secta leader El Mesias and Ozz. This would come to a head when El Mesias was booted from La Secta in September 2008 for losing to long-time rival Vampiro in a cage match. Since that point Ozz took control of the rest of the Dark Family to remake that stable from the rubble that was La Secta. The group has since been interchangeably called La Secta and it's old name of Dark Family. Ozz and company fared badly in their very short feud with Mesias, easily being beat en route to Mesias winning the 2008 Copa Pena. Former member Chessman and Charly Manson were teased as possibly rejoining their old group. Chessman turned on the Dark Family in favor of aligning with Psycho Circus at the first opportunity, and the two sides had a short feud over the Dark Family's most dormant Mexican National Atomicos Championship. Chessman & Psycho Circus won the titles, only to be stripped of the titles the following week. The titles have been ignored since. The Psycho Clown/Chessman short feud is the only storyline the Dark Family has been part of since breaking up with Mesias. Most of the members have appeared on TV very infrequently, filling out sides or serving as generic opponents for tecnicos. Espiritu is a exception; he's completely disappeared from television since dropping the atomicos title, and only occasionally appears on non-televised shows. In Fall of 2009, AAA filmed a match where Ozz was too friendly with the opposing tecnicos for Cuervo and Escoria's liking, leading to disagreement between the team. The match was cut from the television, and the storyline was ignored. The Black Family spent the next year mostly on the fringes off AAA TV. They turned up a it, but only as filler. Their longest run was as opposition to Chris Stone as he started joining the rudo turn. Ozz & Cuervo were the surprise replacements for Octagon & Cibernetico in the AAA Originals vs La Sociedad cage match at Heroes Inmortales IV. Ozz, Cuervo, and Espiritu explained Marisela Pena had asked them to join the team, and they did it out of their loyalty to the legacy of Antonio Pena. The 3 also explained Escoria had chosen a different path. Escoria later debuted as the newest member of Los Bizarros, with a new look. After siding with AAA, Ozz, Cuervo and Espiritu joined with La Parka and new comer Drago to form El Inframundo. The stable feuded with Cibernetico and his Los Bizarros stable. Ozz & Charly Manson left AAA while Cuervo reunited with Escoria and formed a team with Zorro called Los Xinetez. This page was last edited on 14 April 2016, at 23:27.